Business travellers are craving technology, but is that all they need? That's the question posed this week by Steve Cassidy, senior vice-president and managing director, UK & Ireland for Hilton, responsible for the company’s multi-brand portfolio across the British Isles. 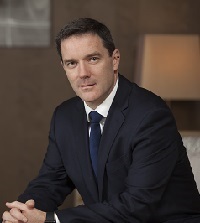 He joined Hilton’s revenue management team in 2009 from British Airways, moving into hotel operations in September 2011. His remit expanded in 2015 to include all Hilton’s owned and managed properties in UK & Ireland. He is chairman of the Hospitality Guild and a board director of the British Hospitality Association. Providing world-class hospitality to business guests has been a part of Hilton’s DNA since day one. When our founder, Conrad Hilton, opened his first hotel in 1919 on a roadside in Cisco, Texas, it provided a quiet place to sleep for visiting workers at the surrounding oil fields. It rented rooms in 8hr hour shifts to accommodate the high demand from visiting oil workers. Since then, the world of business travel has changed immeasurably. It has also ballooned in line with the exponential growth of the hospitality, travel and tourism sectors. In Europe, the Middle East and Africa, Hilton opened its first hotel in Istanbul in 1955, and today we have more than 100,000 trading rooms in the region. As a proportion of this heightened demand, today roughly 25p of every pound spent on travel is spent by a business traveller. Over the years, the needs of business travellers have evolved beyond just needing a place to lay their heads. Expectations are (rightly) much higher and we are always developing our proposition to maximise the business guest’s overall experience and make being on the road as pleasurable and worry-free as possible. Business travellers now plan, book and ultimately experience their trip differently and new technologies have become more important in a modern age of tight time pressures and congested itineraries. Increased use of mobile platforms is changing the way in which people travel for business. Moving beyond just browsing for inspiration, business travellers are booking their travel comfortably via mobile devices. It’s expected that mobile booking from smart phones and tablets will account for the majority of digital travel bookings in 2017. This rise in mobile use can be attributed partly to leisure trends transcending to corporate travel – business travellers, men and women, are seeing the synergy when they plan, book and experience travel in their own time and want to replicate that on the move with work. The other key driver is convenience. Airlines and travel management companies are evolving ever-improving apps with functionality that can update with gate numbers and delays for flights, to mobile check-in and instant messaging on changing travel plans. For Hilton, the Hilton Honors app enables more than 1m digital check-ins per month. Guests have the reassurance of selecting the room they want and control over their pre-arrival elements, from room temperature to the type of pillow they like. We are also introducing Digital Key, which allows guests to use their phones to enter their rooms. This technology has been rolled out in the US and is currently available in more than 1,000 hotels worldwide. On average, three quarters of business travellers in Western European countries prefer using self-service technology to manage their travel and the functionality has grown to become the most-used function on travel-related mobile apps. With the demand for straight-to-room technology increasing, Digital Key is enhancing guests’ arrival experience at our hotels – giving them the time back to do what they want to do. With all this said about the business traveller’s rising need for technology, though, their needs are much more diverse and wide-ranging than just good tech. More of our business guests are interested in wellbeing and the impact their stay is having on their health, the environment and local communities. For the business traveller, a healthy attitude and eco-friendly policy is increasingly important throughout their travel and stay. At Hilton, we have rolled out Meet with Purpose, a programme of events promoting a more sustainable and efficient way to conduct corporate meetings. Guests are offered healthy, locally sourced meals while physical activity is injected into itineraries to boost productivity and help alleviate stress. The meetings are environmentally regulated with the aim of reducing the carbon footprint of large scale conferences. Meet with Purpose is available at many of our hotels across the world, including all of our UK hotels, and is gaining traction with guests. Business guests are also now looking for more than just a bed while travelling – they want a home away from home and we’re reflecting their behaviours into the way we design our hotels. For example, they are choosing to complete work which would have traditionally always been done at the room desk, in communal areas instead. We’ve factored this in to the way we now design public spaces in some of our hotels to provide opportunities in the lobby and other spaces in our hotels for guests to work and relax. Above all, with leisure and business travellers alike, we are guided by one simple fact: it is a business of people serving people. No matter how streamlined, synergised, innovative or rational business travel is becoming or may become as a result of technology, business travellers will always appreciate a warm welcome and smile on arrival. That has always been our number one focus. Hilton’s mission is to be the most hospitable company in the world and although we’re constantly innovating we have never lost sight of creating heartfelt experiences for guests. We’ve been doing it for nearly a hundred years, from the very first oil field worker in Cisco, Texas, to the millions of guests at our 100,000 rooms here in Europe, the Middle East and Africa.